this is one of emma’s christmas presents this year. i have known this for a few months now, and i have been scoping out the best price for it. target had a coupon the week before thanksgiving for $15 off. that was nice considering its regular price is $79.99. so, of course, i went and bought it. then, to my surprise, the cottage goes on sale at target for $49.99!!! man, was i upset. i decided i would go back to try to get reinbursed for the difference and it was no problem at all. I LOVE TARGET! anyway, to make a long story short, all of the accessories that you can buy for the cottage were on sale, too. i decided that i am only going to buy her the house (which comes with the stove) and add the other parts later (you can buy a nursery, sink, and washer, too.) but i did want some of play food for it. i want the muffin set and the stew set. ALL of the targets in san antonio were out. yes, ALL of them. i had a nice worker scan the codes for the items and he searched for them. he couldn’t find any, and on top of it all, he said it looked like they were discontinuing the collection. bummer. i tried to not let it control my thoughts… i really did. but, in the end, i ended up wanting these extra things so badly that i called my mom and had her look at the targets in her area in mcallen. she went to 4 of them, and thankfully found the things i wanted. had she not, i was prepared to call my sister in las vegas next. 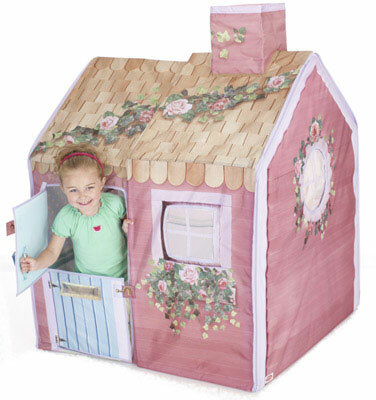 i became a crazy woman for the rose petal cottage stuff. Denisse – I got our niece the muffin set for her birthday…they had it for a pretty good price on amazon. they may have some more of the stuff there too – plus they had it with super saver shipping! w00p! Target rocks! Please let me know if you want me to look here in Florida for anything! heather, you rock! i will let you know! Hi sister! Sooooooo, I went to the Target here and they did the scan thing and we’re out here too! Sorry, love you! Next Next post: Happy Birthday, Daddy!